Session 366. Four amigos (Stu Styles, Stuart Webb, Tarren Peters and myself) set off for a kitesurfing weekend to SE South Australia. Departing at 5am we headed west past Geelong onto to Hamilton for a great breakfast, then through Coleraine, Casterton and Penola and across towards Robe. Wide open roads with very few cars. We stopped at Beachport for our first session, a fantastic location. A local kiter was out having a good time when we arrived. There was good solid wind and nice fun small surf on the beach. After kiting the waves for a while we took of for a tour past the very long pier (750m) out to Penguin Island. There were some buoys above cray pots set on reefs that we had to dodge. Then we went out past the island to look up the coast towards Robe. Lots of rock platforms and headlands - quite intimidating. We returned downwind and had some nice runs in close to shore. Then I headed across the bay to the distant surf beach and picked sections where some really nice waves for breaking clearly and work my way back to the departure point. This session rated 10 out of 10. Great wind, location and scenery and some nice waves. Hi Peter. 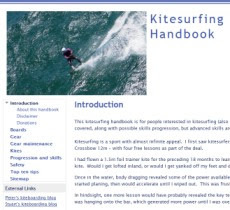 Just ended up in your blog after a search in Google about Sansy point kites urging spot. What a great blog! So much good information! Congratulations and hope to meet you out there in the water! Sorry. I meant Sandy Point kitesurfing spot.